USB device forensics can be difficult. It is fraught with a number of caveats. The data points that can be relied upon vary based on the specific version of Windows, the type of USB device, the type of drive on which the operating system is installed, and more. Compounding these, Windows 10 further complicated things with the device cleanup process, which removes USB device-related records from locations that have long been relied upon by tools and examiners. To help combat these issues and more, I developed USB Detective. For those that want to skip the details below, USB Detective can be downloaded from usbdetective.com. There are two versions of USB Detective: community and professional. The community version can be freely downloaded and the professional version can be purchased from the site. Note that you must have .NET version 4.6 or higher installed to run USB Detective! USB Detective aims to ease the burden on the examiner by visually distinguishing attributes with inconsistent timestamps from those with multiple corroborating sources. This is accomplished by leveraging numerous data points for the identification of USB device attributes such as the first connected and last connected time. USB Detective organizes its findings in a way that allows for easy reporting to non-technical individuals or in-depth analysis and reporting for examiners. The source of every value reported by USB Detective is also maintained to allow the examiner to verify and document the results. Associating a single data point with a specific event, such as a device connection or disconnection, can be problematic if the examiner ignores the context of the data point. For example, the Enum\USB subkey hierarchy in the SYSTEM hive is a well-known location for, in some cases, identifying the last time a USB device was connected to a system. However, this subkey hierarchy can be updated through events that result in the Last Write time of all subkeys in the hierarchy being updated to the same date and time. This is a well-known behavior, but one that an examiner must be cognizant of during analysis. In many cases, there are other data points available that accurately reflect the targeted event. Investigating multiple data points known to be tied to the target event allows the examiner to identify corroborating timestamps and determine the overall consistency across the data points. For example, an examiner taking this approach may determine that four out of five of the data points (subkeys, values, log entries, etc.) known to be associated with the target event are the same or within a couple of seconds of one another. This would likely increase the examiner’s confidence in his or her findings and help to identify unreliable data points on the system under investigation. USB Detective takes into account multiple data points that are available for some of the key USB device attributes such as first connected, last connected, volume name, and more. After compiling all queried timestamps associated with a specific event, the gathered timestamps are compared and the consistency of the reported timestamp is displayed to the user via USB Detective’s consistency level color-coding. This allows the examiner to quickly identify the specific attributes that have inconsistent timestamps and those that have multiple sources of corroborating data. Windows 10 (and some earlier versions) removes some of the most well-known USB device artifacts through its “device cleanup” procedure for devices that have not been recently used by the system. 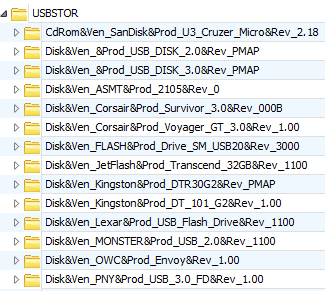 David Cowen reported this in April last year and described a scheduled task that will remove many common USB device registry subkeys during the process, including those in USBSTOR, USB, WPDBUSENUM, and STORAGE. In other words, USB device entries in these locations are removed during the device cleanup procedure. I have observed that a similar action occurs during Windows upgrades, such as upgrading to the Fall Creator’s edition of Windows. During the upgrade, USB storage device-related entries will be removed from many of the well-known locations, including the four subkeys mentioned earlier. This is obviously problematic when it comes to USB device analysis. If a tool or examiner is relying only on the common USB device locations, information about many devices could be missed. In addition to the common areas such as USBSTOR, USB Detective probes many other locations – including some that are not currently covered by the device cleanup procedure performed by Windows. In many cases, the last disconnect time of devices that have been cleared by the device cleanup procedure will still be available (in addition to device serial, description, volume name, and more). The date/time that a device was removed via the device cleanup procedure is also identified and reported by USB Detective. Knowing when a device was removed by the device cleanup procedure can help to provide clarity to the examiner with regard to why certain information about some devices is unavailable. If multiple versions of the registry hives (including amcache hives) are available from volume shadow copies or other means, they can all be fed into USB Detective in order to build a more complete picture of USB device activity on a system. USB Detective aims to simplify the USB device analysis process by identifying USB device data from dozens of locations, reporting key USB device attributes, and highlighting conflicting and corroborating data points. There are many additional features not mentioned here that are currently available in USB Detective as well as many others on the road map for later release. To learn more about USB Detective or to try it out, visit usbdetective.com. I’ve made various updates to VSC Toolset since its last public release in September 2012 and wanted to write a quick post about some of the updates for those interested. The most significant additions to the tool have been two new batch scripts: one for comparing the contents of a directory between two VSCs and one for extracting the USB device connection and disconnection events from one or more VSCs (based on the event log and Event IDs detailed here). There have also been numerous user interface and general usability enhancements made to the tool. Read on for more details, or you can skip to the VSC Toolset page to download the latest version. It can be helpful to see how the contents of a directory have changed over time. For example, identifying how an employment contract has been updated, not updated, or even created and deleted over a period of time can be critical in accomplishing the goals of your examination. VSC Toolset previously supported (and still supports) running a batch script utilizing diff.exe to compare two VSCs, but that may be overkill in many cases. Being able to specify a particular directory for comparison is much quicker and helps to eliminate the noise found in the output of running diff.exe against the entire VSC. The “CompareDirectory” batch script addition to VSC Toolset works by first creating a file listing of each directory to be compared using the “dir” command. It then compares the two directory listings using diff.exe, generating output similar to the screenshot below. In my last post, I introduced a batch script that can be executed against a Microsoft-Windows-DriverFrameworks-UserMode/Operational event log originating from a Windows 7 system to identify USB device connection and disconnection events. In order to port over a version of the batch script compatible with VSC Toolset, I made a couple of slight modifications (primarily to the input variables). Simply select the linked VSCs against which you want to execute the batch script and click “Run Command”; VSC Toolset takes care of the rest (with some help from Log Parser). A separate CSV file containing the USB connection and disconnection events is created for each VSC the batch script is executed against. Note that you’ll need the LogParser.exe and LogParser.dll file in the same directory as the VSC Toolset executable for this batch script to work. Log Parser can be downloaded here. The real benefit in running the EventLogUSB-Win7 batch script against multiple VSCs is that it allows you to recover USB connection and disconnection events that have since rolled off the current DriverFrameworks-UserMode/Operational event log. This can be invaluable in cases where the length of time a certain device was connected to the system is important and the time frame of interest is prior to the earliest event in the current DriverFrameworks-UserMode/Operational event log. In addition to the CompareDirectory and EventLogUSB-Win7 batch scripts, various user interface and general usability enhancements to VSC Toolset were made. These include tips in the output of some commands (e.g. CompareDirectory) to help make the output easier to understand and a few help buttons added to the interface in some situations (depending on which command is specified in the Command drop-down box) to clarify exactly what a specific parameter is requesting. The file system view, visible after clicking “Browse Shadow Copy”, has also been improved to allow for sorting by file name or date by clicking the appropriate column header. To ease the burden of finding all of the supporting tools you’ll need to take full advantage of VSC Toolset, I’ve added the download links and any special requirements for each on the VSC Toolset page. This information was previously scattered across multiple blog posts. I’m always open to and appreciate feedback, including suggestions for improvement and bug reports. You can download the latest version of VSC Toolset here. Corey Harrell’s auto_rip has been integrated into VSC Toolset. Version 20140216 includes this update. Last month, I wrote about utilizing the Windows 7 Event Log in USB device tracking. In my previous post, I mentioned automating the process using Microsoft’s Log Parser, but didn’t go into much detail regarding how to do so other than a couple of Log Parser queries. This post introduces a batch script that can be used to quickly identify USB storage devices that have been connected to and disconnected from a Windows 7 system based on information available from the Windows Event Log, specifically the Microsoft-Windows-DriverFrameworks-UserMode/Operational event log. The Log Parser query described in my previous post identifies the connection and disconnection events associated with a given device identifier, but is limited in that it requires the user to have knowledge of the USB device identifier and must be executed for each device identifier of interest. In many cases, an examiner will not have knowledge of the device identifier(s) that should be targeted or may be interested in a listing of connection and disconnection events within a particular time period (regardless of the device connected). This batch script accepts a Microsoft-Windows-DriverFrameworks-UserMode/Operational event log as input and parses the connection and disconnection events associated with each unique USB device identifier, based on the connection and disconnection Event IDs described in my previous post (i.e. 2003 for connect, 2100 for disconnect). It may seem odd at first to remove duplicate device identifiers in Step 2, but this important step eliminates the duplicate entries that would otherwise be found in the script output and allows for quicker execution of the script (as each device identifier will be queried only once within the event log). The script output is in CSV format and may look something similar to the screenshot below. The output includes the type of event (connect or disconnect), the device identifier, the time of the event, and the LifetimeID associated with the USB device connection session. As you can see, the screenshot above details three separate connection sessions for two different USB devices. We know there are two separate devices because of the different device identifiers and we know there are three separate connection sessions by comparing the LifetimeID values. For a refresher on the LifetimeID value, see my previous post. The output of the batch script allows an examiner to easily pair connection and disconnection events using the LifetimeID value as well as quickly determine which devices may have been connected to the system at the same time by identifying different devices with the same LifetimeID. Since the script output is in CSV format, filtering and sorting is easily accomplished using a spreadsheet editor. Since the batch script relies on Microsoft Log Parser, you will need to download Log Parser here and ensure LogParser.exe and LogParser.dll are both in the same directory as the batch file. The script is available for download here.